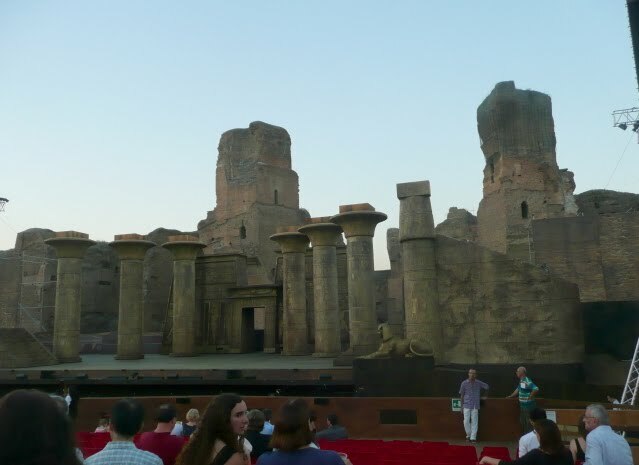 We went out to see Aida at the Baths of Caracalla in Rome. I remember from the past that there were pipes in the ruins that looked like part of the stage, so I was pleased to see that the stage machinery stands before the ruins but does not touch them. The ruins of the baths make a fine backdrop for the set which looked a lot like ruins from Egypt: movable columns and figures and monuments. The trumpets from the march stood in banks on the sides. One cannot help comparing it to the Arena di Verona, since it is also an outdoor venue. In Verona the set pieces can be removed entirely through a gap at the back of the stage. In Rome they seemed to be only moved around. 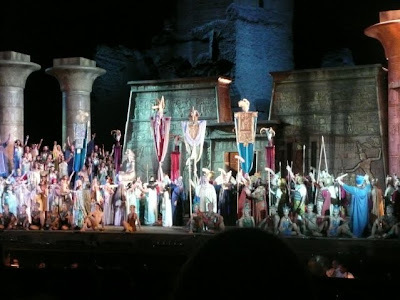 The cast of Aida is large and often appears with the chorus on stage. In these scenes nothing was done to distinguish the soloists from the chorus. 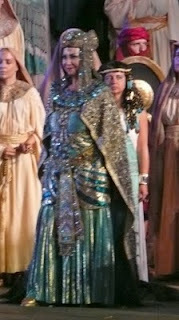 First rule of opera costume design: soloists must never blend in with the chorus. People would start to sing and you simply could not find them on the stage. This picture is our view. Daniel Oren was the excellent conductor. 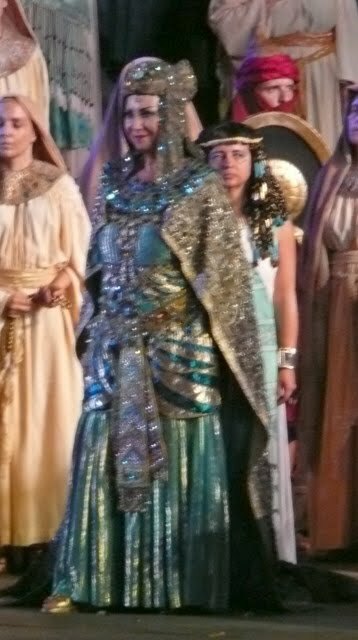 Aida was ably sung by Micaela Carosi. Giovanna Casolla who sang Amneris has a huge penetrating voice. She interested me most. 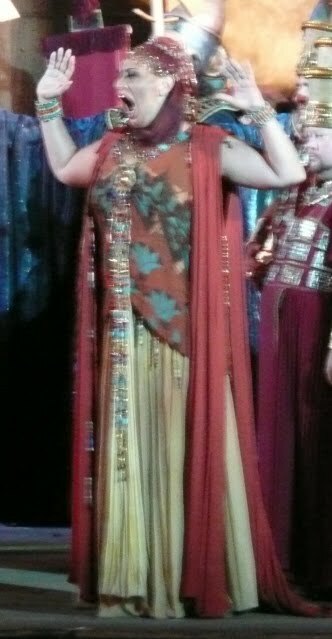 Radames was sung by Walter Fraccaro. All three were best in the final death scene. 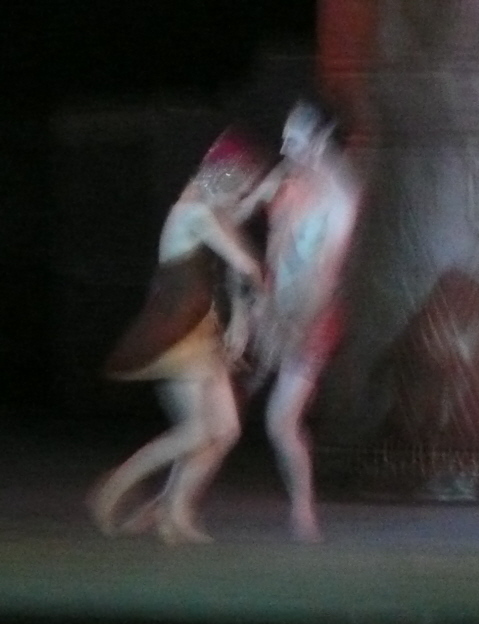 There was lots of very nice ballet but no march to speak of. The seats were comfortable--perhaps too comfortable--and the weather was pleasant. I heard a bit of thunder, but no rain appeared.